Fifteen minutes. 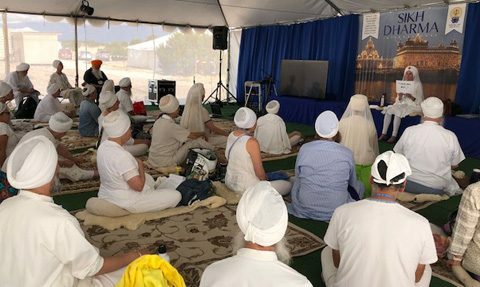 That was the window of time we had been given to set up a powerful and transformational lecture video of the Siri Singh Sahib to watch during our 2018 Summer Solstice Ministers’ Gathering. We had never attempted to present a video at our previous Solstice Gatherings, especially at Ram Das Puri, which is a remote site in the Jemez Mountains of Northern New Mexico. My assistant Sarb Nam Kaur and I arrived a few minutes early at the Gathering site. (We had to wait until the previous class had finished.) Sarb Nam had actually gone up to the Solstice site the day before to assure that everything we needed was in place. She was told by the staff that everything would work. Now, as Sarb Nam Kaur hooked up her laptop and the Siri Singh Sahib appeared on the TV monitor, we thought we were doing just fine. However—we discovered there was no sound. The classroom facilitator told us that they were having technical problems with the audio. He was trying to find the sound assistant. By now, the Ministers were all gathered and it was time to tune in and begin. Several people jumped in to attempt to correct the audio situation. I just prayed. I described a little about the kriya we were (hopefully) going to view, called “Kriya for a Stable and Effective Personality.” This is a very special Laya Yoga kriya taught by the Siri Singh Sahib in Los Angeles on April 7, 1987. I looked at my watch and knew we now had about 12 minutes to get the audio problem resolved. At this point we had several people trying to troubleshoot the situation. I really wanted the Ministers to experience this wonderful kriya. Ten minutes to go and still no sound. “Okay,” I thought, “this requires reinforcements.” I asked a Minister to help lead us in chanting. She had to decline due to vocal problems. I realized that this called for drastic measures. 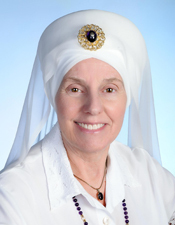 I personally started leading the group in chanting the mantra Guru Guru Wahe Guru, Guru Ram Das Guru. We chanted a capella using the original melody the Siri Singh Sahib taught us. The Ministers and I continued chanting. I glanced over to see if the technical crew had been able to resolve the audio problem. Six minutes left and apparently we still had no audio. 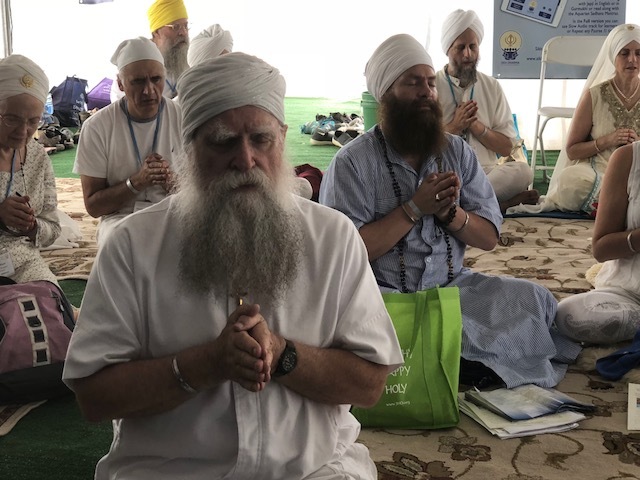 Assistant Secretary of Religion SS Dr. Shanti Shanti Kaur came over and suggested to me that we do the five repetitions of Guru Guru Wahe Guru Guru Ram Das Guru on one breath to clear any blocks. We all joined her in chanting. Only three minutes remained before we would have to start the video. I checked with Sarb Nam Kaur and still there was no sound for the video. The Ministers kept chanting. Only one minute was left in our 15-minute window. Someone came running in with the missing remote control for the TV set. They clicked it on and voila, we had audio! 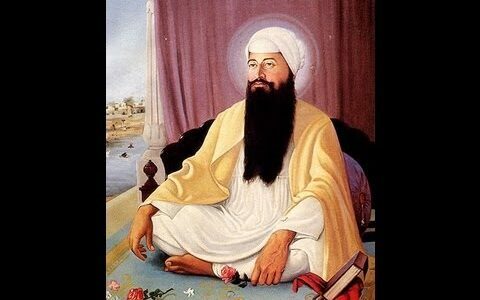 By God’s Grace and Guru Ram Das’s assistance, we were finally able to show the video—with just 30 seconds to spare! The Ministers enjoyed the transformative lecture and kriya. 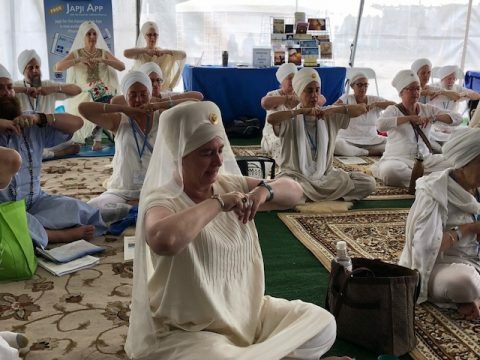 We hosted one of the largest Minister Gatherings to date—and it was a powerful opportunity to come together to meditate, pray, and experience the miracle of Guru Ram Das! 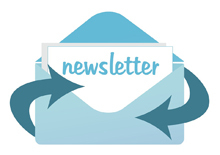 If for some reason you were unable to attend the Summer Solstice Ministers’ Gathering, please do yourself a favor and click on the link to enjoy the lecture and kriya.